Recently, the small village of Coverack in Cornwall was hit by a flash flood which resulted in damaged properties and possessions, closed roads, disruption, and required the rescue of several people. This was not a one-off event. Flooding is a major risk for the UK. Currently there are around 5 million people in 2.4 million houses at risk from river, sea, underwater or surface flooding, which is likely to become worse in the future due to climate change. In general, floods can be reoccurring, as well as affect the same population over time. Moreover, their impact can persist for more than two years through damage to physical infrastructure, rebuilding and financial problems, as well as psychological effects to residents like stress, depression, and anxiety. In my PhD research, I investigate how communities respond to floods. Decades of disaster research have shown that during adversity people come together, and previous social psychological research on ‘sudden impact’ (unexpected and unpredictable) events like earthquakes and bombings has applied principles from the self-categorisation theory (Turner, Hogg, Oakes, Reicher, & Wetherell, 1987) in an attempt to explain how previously unaffiliated people are suddenly drawn together in the face of adversity. What has been shown is that people unite in groups because they share a sense of common fate. In turn, this group feeling mobilises support between them, increases expectations of future support, and enhances participation in collective action. However, no research had previously examined whether the same social psychological principles also apply in ‘rising tide events’ like floods, which are usually expected and allow some time for a coordinated response. 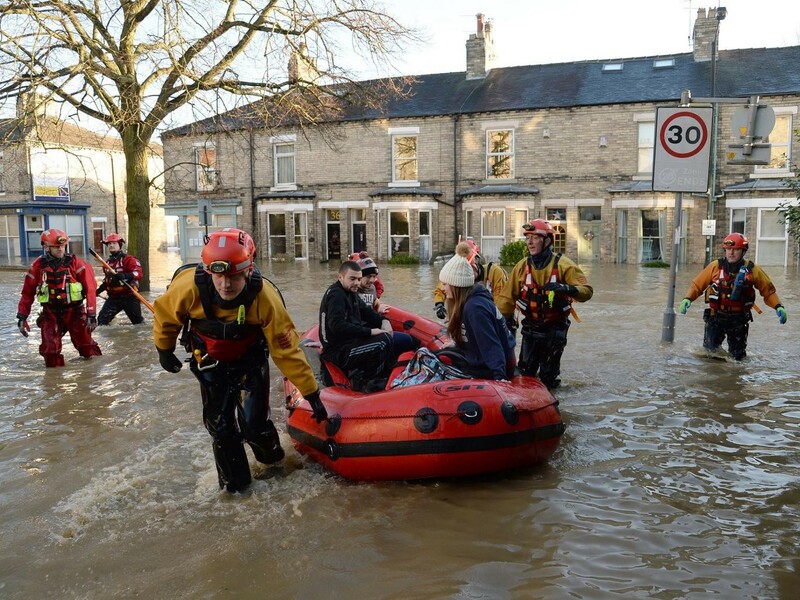 In a recently published study, I investigated whether social identities did emerge in the flood-hit city of York, UK. York flooded in December 2015 during the passing of Storm Eva, due to a flood barrier which was lifted by the Environment Agency in an attempt to contain further damage. Almost two months after the floods I visited and got interviews from 17 residents. I interviewed flooded, non-flooded, and indirectly affected residents (who faced neighbourhood disruption or limited access to resources, but did not have water entering their properties), and my aim was to explore whether people felt as part of the community, what motivated such feelings of togetherness, and whether social support was a function of this emergent unity. I found that similar processes to ‘sudden impact’ events also occur in ‘rising tide’ disasters like floods, and that there were multiple pathways through which people felt they identified with the flood survivors, regardless of their flood status. For example, flooded residents talked about a sense of shared fate that united them with the other flooded people. For non-affected and indirectly affected people, previous group boundaries collapsed and unity emerged because the flood event was perceived as an injustice towards the affected residents, because it was perceived as a disruption of routine life, and interestingly because it hit an area the residents of which were perceived as unprepared. Also, it is important to note that residents came together because of sharing similar goals in terms of recovery, as well because of a reportedly lack of supportive infrastructure. This emergent togetherness was also linked to the provision of social support, at a practical, emotional, and collective level, with residents providing resources to the affected, gathering and organizing donations, assisting in cleanups, listening to people’s problems, giving advice, and coordinating with each other to carry out tasks impossible to execute individually. However, I also noted negative experiences from residents who did not feel included in this emergent community spirit; residing in an area outside the scope of the collective response, losing one’s supportive networks, or failing to see others adopting group-helping behaviours was described as generating negative feelings. Through this exploratory study I and my supervisors shed some light on the ways that communities respond to floods, and the role that shared social identities can play. Indeed, people in ‘rising-tide’ events can come together similarly to ‘sudden-impact’ events, the support mobilized during these instances of unity can enhance people’s collective resilience and the overall resilience of the community. Thus, I argue that while pre-existing networks are crucial for the response and recovery periods, government policies and emergency responders should take into account the emergent community spirit, consider how they can be a part of it and foster than hinder it, and assist in its continuation over time. Original post published in Crowd and Identities: John Drury’s Research Group Blog. The full paper “Emergent Social Identities in a Flood: Implications for community psychosocial resilience” has been published at the Journal of Community and Applied Social Psychology, and can be found here. Turner, J. C., Hogg, M. A., Oakes, P. J., Reicher, S., & Wetherell, M. (1987). Rediscovering the social group: A self-categorisation theory. Oxford: Blackwell.